Lok Satta Party national President Dr. Jayaprakash Narayan today appealed to the President of India and all parties in Parliament to save the country from the onslaught mounted by the UPA Government against federalism. Addressing a media conference on the Bill adopted by the Union Cabinet to bifurcate Andhra Pradesh, Dr. JP said that the President of India has to act as bridge between States and the Center. If the Andhra Pradesh Legislature rejects the Bill to bifurcate the State, the President has to take note of it and refrain from recommending its passage by Parliament. All political parties in Parliament should realize the threat to federalism posed by the minority UPA Government’s unilateral and dictatorial decision to divide Andhra Pradesh. Quoting the saying that ‘fools rush in where angels fear to tread,’ Dr. JP said that the Union Government has chosen to divide the State without working out a consensus among all regions. Dr. JP recalled that in respect of formation of States so far, the Union Government has always obtained the prior consent of the State or followed the recommendations of a commission or committee before it created any State. The Union Government has now chosen to set a dangerous precedent that threatens to undermine the unity and federal character of the country. India has become a de facto unitary nation with the Union Cabinet decision. Dr. JP pointed out that the Union Governments in the past had brought about a consensus among all regions before it divided any State through patient negotiation. Bihar Chief Minister Lalu Prasad Yadav who asserted that Jharkhand could be formed only over his dead body himself came round to moving the division resolution in the Assembly after negotiations. 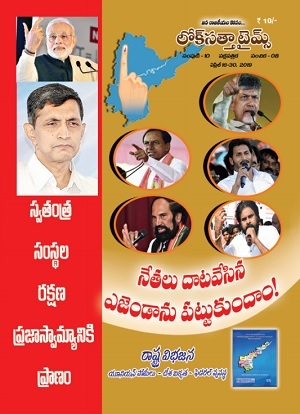 Dr. JP said that the UPA Government has decided to bifurcate Andhra Pradesh without addressing attendant problems. 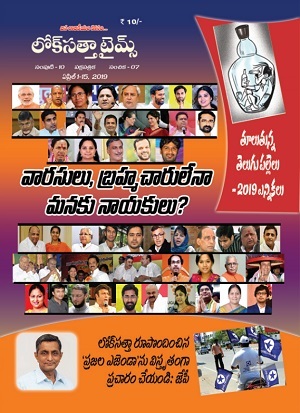 The 120-page Union Cabinet is silent on addressing problems of the most backward region of Rayalaseema. It does not say how the residual Andhra Pradesh is to be run with an annual revenue deficit of Rs.7000 crore following the loss of Hyderabad. Dr. JP appealed to people to voice their protest peacefully without resorting to violence or disrupting normal life. Theirs is a fight against the egoistic Delhi rulers and for preserving the federal set-up. Replying to a question, Dr. JP said that there should be voting in the Legislature on the bifurcation Bill or the members’ views taken in writing. When asked whether Coastal Andhra and Rayalaseema legislators who are in a majority would ever allow formation of Telangana, Dr. JP pointed out that all the States hitherto formed had only minority members in the Legislature. But a concensus was arrived at through patient negotiations. Dr. JP reiterated that the Lok Satta would welcome formation of Telangana as part of a comprehensive and amicable settlement among all regions of the State. The UPA Government has decided to bifurcate the State not out of love for the people of Telangana but with an eye on votes and seats in the next general elections. State Lok Satta Party President Katari Srinivasa Rao, Vice President Y. D. Rama Rao and Secretary Nandipet Ravinder took part in the media meet.